This new academic year will mark 20 years since St Edward’s became fully co-educational. The School will begin celebrating this significant anniversary with an exhibition at The North Wall gallery from Tuesday 5th September. Teddies has come a long way since the early days of co-education, with girls living in off-site accommodation in Summertown, to now being within sight of the boys to girls numbers being 50-50 in the near future. The exhibition will encompass works from seven former female pupils who all studied art at St Edward’s, going on to establish their careers as professional artists and artisans. The wide range of styles, media and techniques on display, with ceramics, illustrations, jewellery and drawings, highlight the wealth of talent of the women exhibiting their work, as well as demonstrating the exceptional state of art tuition at St Edward’s in recent years. You can read a brief synopsis of each artists’ work, style and career progression below. 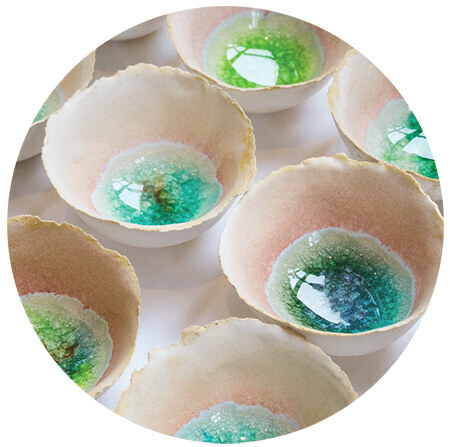 Rose Barry has studied ceramics for several years, and specialises in clean, minimalistic and contemporary pieces. The ‘Egg Shell’ series (as seen to the right of the page) developed from a modulation project in which she wished to add to the simple, fragile structure of an egg shell by incorporating different coloured glass. Visit her website here. Harriet Blomefield is a freelance artist and designer. Her degree is in History of Art, which led to her interest in, and love of, architectural drawing and painting. Her work on show includes paintings of aspects of St Edward’s created especially for this exhibition. Visit her website here. Lâle Guralp specialised in printed textiles at Chelsea College of Art and Design, before going on to design soft furnishings with Sir Terence Conran for 2 years. She has gone on to become a freelance designer and artist based in London. All her work is drawn in HB pencil on slightly textured paper. Using these simple materials she produces highly detailed, intricate drawings. Visit her website here. Lucy Smallbone has a Masters from Slade School of Fine Art and has won the David Balladie award, the Hayward Trust award, the Duveen travel prize, and the Emerging Artist Award at AAF 2015, among others. Her first solo show at Space Station Gallery in London was included in the Catlin Guide 2011. View her website here. Miranda Stewart trained in Fine Art at Falmout School of Art, before going on to study Anthropology at the University of Exeter. To date, she has had two exhibitions, the first at The North Wall gallery in February 2015, before exhibiting at The Arch Gallery in London in November 2015. The latter exhibition was for the Red Light Campaign charity, presenting a series of figurative paintings focused on the freedom of trafficked women. Miranda specialises in oil paintings on either canvas or paper. View her website here. Cecily Vessey completed her art foundation at Chelsea College of Art and went on to study Jewellery and Silversmithing at The John Cass. She is known for her architectural illustrations with London’s iconic skyline being her signature image. Her latest project is a series of 12 screen prints in collaboration with textile designer Georgia Bosson depicting landmarks from around Britain, and a limited edition print of The view of the Teddies Quad, Chapel and Cloisters that she has created especially for the exhibition. View her website here. Rebecca Wilkes is a recent alumna of the School of Jewellery in Birmingham and is currently studying on their Design for Industry course. Rebecca’s jewellery is handmade and embraces the uniqueness of the industry in this country. 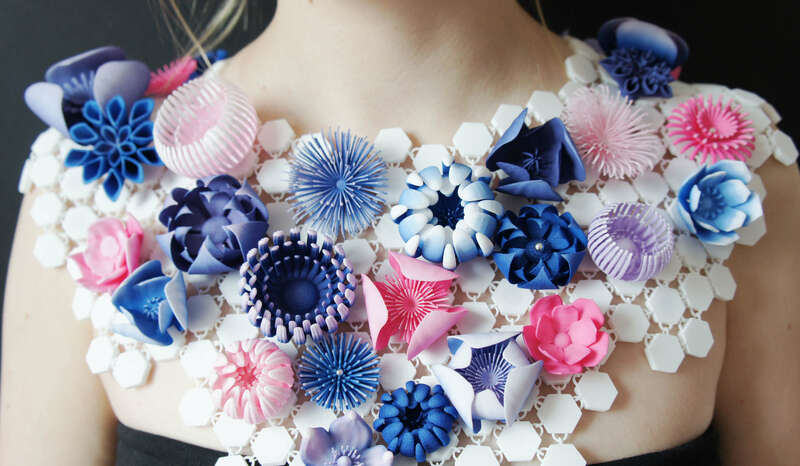 Her inspiration comes from nature and she creates one-off pieces of jewellery (such as the necklace, pictured right) ranging from rings through to brooches. View her website here. Visit The North Wall website for exhibition opening hours. Pupils are able to visit the gallery at any time, around their other commitments.